It's always a good idea to write a letter of appreciation to express thanks and gratitude to someone who has provided help or assistance to you, whether this is during a job search or simply in the daily course of your performance in the workplace. These letters aren’t difficult to write reviewing a sample letter of appreciation may make it even easier for you. Throughout your career and job searches, you'll likely get a lot of help. Mentors and bosses will provide advice and strategy, while co-workers may help with projects and training. Others may freely step up to cover your work responsibilities in the event that you become ill or have to take an unanticipated leave of absence. Many people will likely make introductions or connect you with jobs or contacts. In fact, there are endless opportunities to express your appreciation to all the people who've aided you. Sending a letter of appreciation is a great way to reach out and make others aware of your gratitude for their help. It's a courteous gesture – and also helps increase the likelihood that people will lend you a hand again in the future. A letter of appreciation does not have to be long. Sincerity is more meaningful than length. Begin the letter with a greeting, and then let the recipient know why you're writing. For example, you might say: "Thank you for bringing me up to speed on the new accounting program," or "I just wanted to let you know how much I've appreciated your advice over the past two weeks as I debated those two job offers." Next, share more details about how much the recipient's help has meant to you. Thank them again before your closing sign-off. 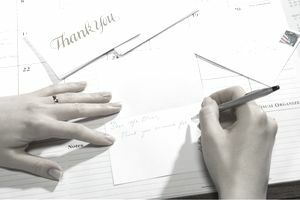 Your letter of appreciation can be as simple as a short thank-you email, but since email inboxes overflow, it might be even more meaningful to mail a handwritten letter or card. Getting a hard copy letter of appreciation will really make the recipient’s day by showing how you much you truly appreciate how their help elevated you to where you are now. Remember it’s important to take the time to thank everyone who helps with your career or job search. Here is a sample appreciation letter to send to a contact who has provided assistance. I especially appreciate your offer to connect me to others in your network. I plan on following up with the contacts you emailed me right away. I will also use the online networking resources you recommended to further my job search. Any additional suggestions you may have would be welcome. I'll update you as my search progresses. The email message should include everything in the example above from the salutation on down. Thank you letters are so important in all aspects of your career. Review how to write a thank you letter, including who you should thank, what to write, and when to write an employment-related thank you letter. Keep in mind that it’s important to thank everyone who helps with your career or job search. Look at these appreciation letters samples for ideas for letters and email messages to send to contacts who have provided assistance. These thank you for the job interview letter samples are good to know as well. If you need information on other types of letters, you find these letter samples to be helpful. The examples include cover letters, interview thank you letters, follow-up letters, job acceptance, and rejection letters, resignation letters, appreciation letters, business letters, and more great employment letter samples that will help you get all the employment-related correspondence you’ll need to write.